Remedies for Reflux/Heartburn During Pregnancy. You don’t have to just suffer through and accept the pain. There are things you can to do relieve heartburn and reflux when you are pregnant. Having reflux or heartburn during pregnancy is super uncomfortable. It can lead to poor sleep–no one wants poor sleep before welcoming a baby to the world. Reflux can also lead to chronic coughing. This post talks about ways to remedy reflux and heartburn when pregnant. First of all, the picture has nothing to do with heartburn other than the fact that the baby I am looking at in my belly is causing my heartburn. That was a week ago. I had this plan to write this post on remedies for reflux/heartburn while pregnant and then realized my ideas are pretty weak. I think they are ideas pretty much everyone knows. Just in case not, I will share. Or if nothing else, it will get the “obvious” out of the way to make room for the life-changing ideas I hope you have for me (hey, no pressure). 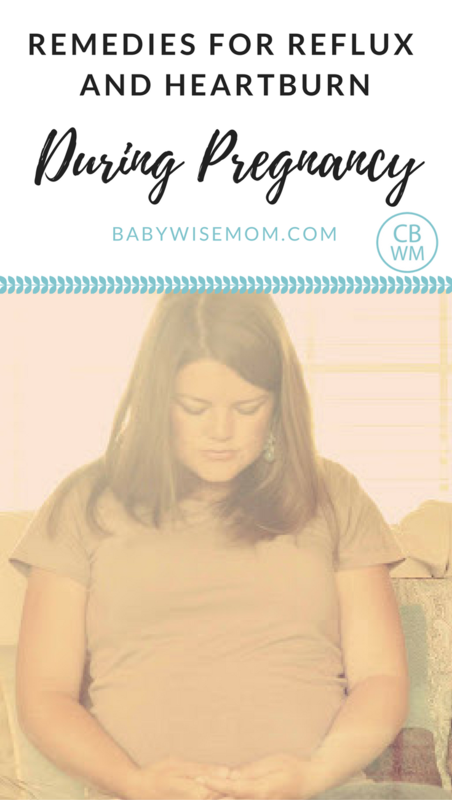 Reflux during pregnancy is something I have basically always just suffered through. I have had it quite severe with each pregnancy. For my current pregnancy, the burning isn’t so bad, but the effects of the coughing due to the burning of my lungs are pretty, um, annoying to say the least. Here is my list of ways to deal with it. Mylanta: This has been my go-to since Brayden. My doctor said Mylanta (remember those commercials? Well, he did). He also said I could drink a whole bottle at once and not hurt the baby, so I felt good with Mylanta. I still use Mylanta today. Avoid Reflux Foods: There are certain foods that will cause you to have more heartburn than others. Avoid those if possible. Sometimes, I just crave something I know is going to cause me issues later on and so I still eat it, but most of the time I anti-crave the reflux rousers. My neighbor swears that Tabasco sauce reduces her reflux. Swears. So you might be surprised what works for you and what doesn’t. Stay Propped Up: Just like you do for a baby, you keep yourself in an upright position for as long as you can after eating. You might also need to prop yourself while sleeping. I find this to be uncomfortable, but sometimes it is the only chance I have to sleep. Don’t Eat Late:: Along a similar train of thought, I avoid late night food. I eat dinner and that is it unless I have some huge craving. I even limit water, which works well for the whole bathroom-visits-in-the-night thing. The effects of what I eat when and when I lay when are very obvious to me this go-around with the coughing. The coughing is an immediate effect, so I am careful and sensitive about what I eat when and how long I stay up (lots of coughing with a weakened pelvic floor is bad news. Enough said). Eat Smaller Meals: Eating less more often might help you minimize the reflux. Don’t Get Empty: Same train of thought, don’t let your tummy get empty. Except for at night when you will be sleeping all night (hopefully!). OTC Reflux Medication: With the coughing, my doctor (you might remember, new doctor with McKenna since my previous OB moved to the East Coast) suggested I take some OTC reflux medication like Zantac or Prilosec OTC. That makes a big difference for me. I take one pill once a day. Stay Ahead: I used to wait until the burning was terrible until I took Mylanta. By the time McKenna was pushing on my stomach, I learned to stay ahead of the pain. At the first sign of heartburn/reflux, I take some Mylanta. I don’t get bad flares anymore. Staying ahead of it works SO.MUCH.BETTER than fighting the fire once it is there. Those are my 8 tips. Now, what tips and tricks work for you? Even if something I said worked–or didn’t work–, please share that so other moms know what is most likely to help them in this situation. 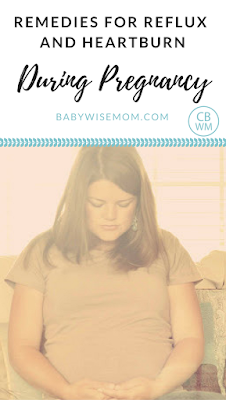 I would love to hear some new remedy I have never heard of though (speaking of, I was just reading through this post from when I was pregnant with McKenna and there are several interesting reflux helps ideas there–so read those comments for more ideas)! Previous Post Can it be too hot to sleep? Next Post Moo Kitty Finds a Home Winner! Nothing really helped me. I had terrible heartburn with my son. I took zantac and lived off of tums, but really…it didn't help all that much. I heard you should drink a glass of milk, but I never tried, being lactose intolerant? In Japan, they had these refreshing aloe drinks that I noticed helped my acid reflux in addition to being a healthy beverage. I had problems finding it in the US during my pregnancy, though. I found a diet version at a Korean grocery store but I didn't like the taste. Maybe if there's a Japanese grocery near where you live, you could find it. If so, look for the aloe yogurt, as well. Very refreshing. I miss lots of things from there! The day my doctor told me I could take Prilosec OTC during my pregnancy was one of the most joyful days of the whole thing. The only times I've had problems since are days when I either forgot to take a pill or ate a whole bunch of lasagna right before bed. Prilosec for the win! Chia seeds! They are all-natural and you can find them at GNC or even Costco. You just swallow a few tablespoons (or as much as you need… thank goodness you can't overdose) before each meal or whenever you feel the heartburn and chase it with water! It's amazing. Zantac did the trick for me too. I tried Tums, which didn't really help. But one Zantac a day did miracles. I also would try not to ever get hungry because the acids would come up if my stomach was empty. I also ate a lot of chicken noodle soup. Anything with a strong flavor would cause me heartburn. My OB has told me both pregnancies that it's okay to take Zantac. It's a TOTAL lifesaver for me. Toward the end of my last pregnancy, I just popped one every day because I knew I was going to need it. If I can find peppermint ice cream (not mint chocolate chip — peppermint. The pink stuff), it seems to help too. Cools the burning feeling. This is probably not doctor approved, but eating a scoop of ice cream at night before I went to sleep would help (except for my last pregnancy, where the only thing that helped was eating Tums like they were candy). I would usually have it with a half of a banana and solve both my heartburn problems and my leg cramps. High dose, quality probiotics and betaine hcl. Heartburn is far more often caused by too little stomach acid than too much. Take a look at http://www.chriskresser.com and search for heartburn for more info. chia seeds? Really? Okay, i have some in my pantry, going to give them a shot. I am 28 weeks pregnant and Zantac and tums are not doing the trick. Chia seeds to the rescue, thanks Christina! Try laying on your left side. This is something I saw on the today show for people with heartburn and it doesn't always work, but it often makes mine better. I am on my third pregnancy and have had heartburn every time, usually after eating too much sugar. Maybe mine hasn't been as bad as others, so this may just be a tip for mild heartburn. Worth a try! I've been told that drinking dill pickle juice helps. I'm 36.5 weeks pregnant with #2 and have been so extremely sick this pregnancy that I just can't stand the though of drinking pickle juice. But worth a try if you can stomach it! Thank you everyone for your comments!I think dairy can help neutralize acid for sure. I have found that sometimes a glass of milk helps a ton.Sabrina–this is weird but pickles have helped me this time with my nausea. I have heard dill can help. It sounds weird but chewing gum during the day helped me a lot – especially at the end when it was really bad! Believe it or not, drinking a couple tablespoons of apple cider vinegar always zapped my heartburn during my pregnancy. (I haven't had any heartburn since giving birth 5 weeks ago). I use Braggs apple cider vinegar. It's pretty strong going down, but always did the trick within a minute or two. ncurles, I haven't tried that but today I had the inclination to! I will definitely try it the next time I have it (which is, actually, always at this point).Amy that is interesting! And worth a try.